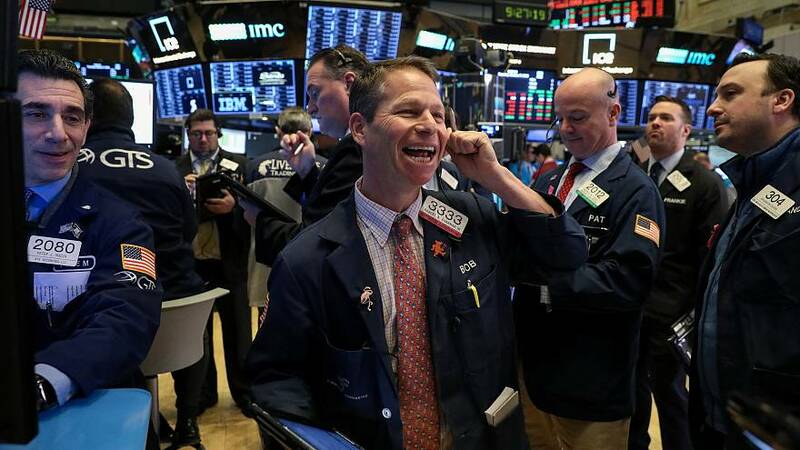 World stock indexes jumped on Friday, with Wall Street posting a fourth straight week of gains, and the dollar had its first positive week since mid-December as optimism increased that an end is in sight to the U.S.-China trade conflict. Stocks were boosted by a Bloomberg report that said China sought to raise its annual goods imports from the United States by more than $1 trillion (£776 billion) in order to reduce its trade surplus to zero by 2024. That followed a report on Thursday that U.S. Treasury Secretary Steven Mnuchin was considering lifting some or all tariffs imposed on Chinese imports. The Treasury denied Mnuchin had made any such recommendation. While the equity rally lifted all major sectors, trade-sensitive industrials <.SPLRCI> posted among the biggest S&P 500 sector gains, up 1.9 percent on the day. The Philadelphia SE semiconductor index <.SOX> rose more than 2 percent and Germany's exporter-heavy DAX <.GDAXI> was up 2.6 percent. "There seems to be some progress going in the trade negotiations," said Bucky Hellwig, senior vice president at BB&T Wealth Management in Birmingham, Alabama. While that was the biggest influence, "we've still got momentum since the first of the year," he said. "Some of the money that came out of the market at year-end, whether it was high frequency traders or tax-loss selling, is coming back in." Adding to strength in equities and supporting U.S. Treasury yields was data that showed U.S. manufacturing output increased the most in 10 months in December. Some strategists said relatively light equity trading volume this week indicated that some investors were still waiting on the sidelines. The Dow Jones Industrial Average <.DJI> rose 336.25 points, or 1.38 percent, to 24,706.35, the S&P 500 <.SPX> gained 34.75 points, or 1.32 percent, to 2,670.71 and the Nasdaq Composite <.IXIC> added 72.77 points, or 1.03 percent, to 7,157.23. The S&P 500 registered its biggest four-week percentage gain since October 2011. The index is now 8.9 percent below its Sept. 20 record close after dropping 19.8 percent below that level - near the 20-percent threshold commonly considered to confirm a bear market - on Christmas Eve. The pan-European STOXX 600 index <.STOXX> rose 1.80 percent and MSCI's gauge of stocks across the globe <.MIWD00000PUS> gained 1.23 percent. Chinese Vice Premier Liu He will visit the United States on Jan. 30 and 31 for another round of talks aimed at resolving the trade dispute between the world's two largest economies. Recent indicators show signs that the Chinese economy is losing momentum. The trade optimism boosted the dollar against other major currencies. The dollar index <.DXY> rose 0.31 percent, with the euro down 0.26 percent to $1.1365. U.S. Treasury yields rose to three-week highs as investors piled back into Wall Street. Benchmark 10-year notes last fell 12/32 in price to yield 2.7878 percent, compared with 2.747 percent late on Thursday. Oil prices jumped about 3 percent, rising after OPEC detailed specifics on its production-cut activity to ease global oversupply. Brent crude gained $1.52 to settle at $62.70 a barrel, or 2.48 percent higher. U.S. WTI crude futures added $1.73 to settle at $53.80 a barrel, or 3.32 percent up.